Ted Arken reported that, "Bob's car looks just like his older one [the Fox Chassis], too bad the picture [on the right] doesn't show any size relative to the other cars. It's 10" shorter in wheel base, and 6" narrower in track compared to the Fox Chassis. I'm 6' tall, and although I had a few difficulties with fitment to the car since Bob is shorter than me, I had the opportunity to drive it at thunderhill two weeks ago. It turns in extremely well, with no hint of oversteer. It's fast down the straights with a stock GSXR, and it's at minimum weight with Bob in it. There is a significant amount of ballast in the car also." 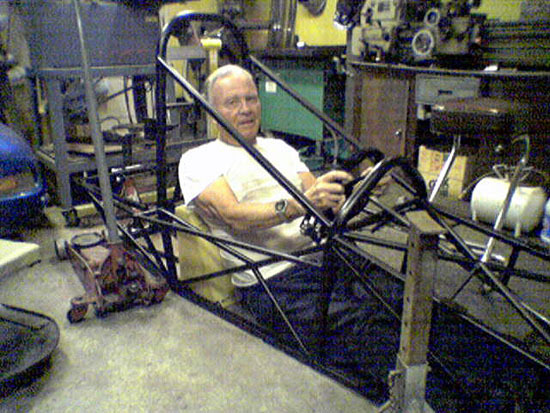 Ted continues, " Bobs car is basic 4130 tube frame underneath. Its fairly similar to an A-Mac single seat chassis. The bodywork is a shortened and narrowed version of the original bodywork." 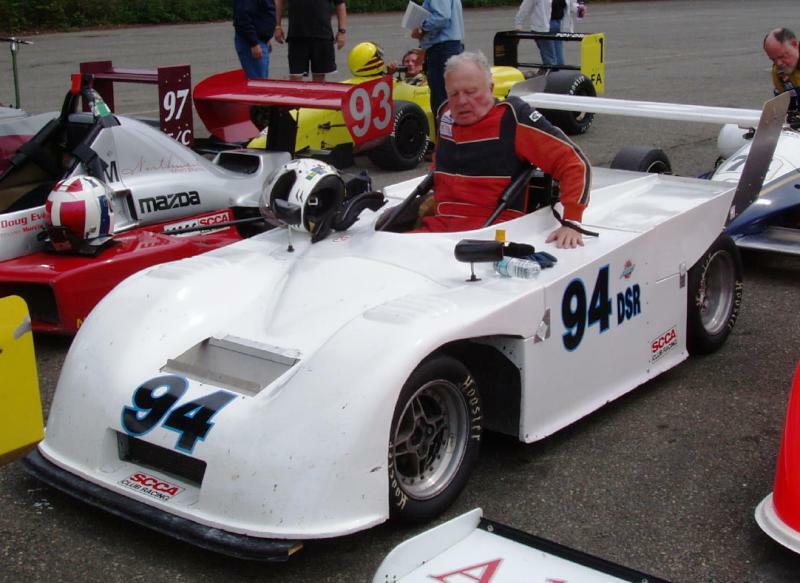 Dave Arken said, "On the Thursday test day before the [August 4-5, 2006, Thunderhill National] weekend, Bob Fox allowed me to drive is new little car and man that was a fun deal. It is extremely quick to respond and you need to be 'fast hands Freddie' to keep up with it. Also, it has a left hand shift, and there was more than once I used the wrong hand and got nothing but air." David Arken reports that, "ThunderHill ended their operational year with a free test day for SCCA members. Bob Fox, Jim Lepetich (our FV friend who helps us on test days) and myself went to the track to do some testing with Squirt, Bob's little car. It was a cold day but clear and sunny with no wind. What a way to end the year, driving at my favorite track with people I enjoy. We went to test some changes Bob made to the suspension and of course a series of adjustment changes. Over all it was successful, the suspension changes were positive and in the end the car was faster than when we arrived. As usual we found some mechanical problems not correctable at the track and determined some new directions for our next steps. We did not get to the track record however considering track temperature, age of tires and drivers, stock engine, we are getting closer to being competitive with the latest generation cars. Bob's car lacks a data aquisition system, so I have to calculate speed from RPM and tire diameter. Based on the numbers and using my data as a sanity check we got top speeds higher than my car in previous tests. Also I have good feel for �G's� in a couple of corners and we reached levels I have experienced on very strong laps in my car. [Earlier] I have made note that we are trying to bring to old technology up to par with the latest. By using both Bob's and my cars with different and similar changes we are getting the best of both approaches." Dave Arken owns and drives an A-Mac AM-6 with a ZX10R engine.